I purchased a Samsung 960 EVO NVMe drive for my Dell Precision 5510 with the goal of leveraging the TCG Opal support for security and performance. With TCG Opal, the NVMe drive can do hardware based cryptography at full speed. The performance is impressive and the cryptography is always turned on. By default the drive has a key and the cryptography engine is always in the data pipeline whether you’ve explicitly locked your NVMe drive or not. Full speed always on cryptography. The NVMe drive is designed to encrypt and decrypt data whether you provide a key or not, it will fallback to a default key for non-Opal operation. No CPU cycles wasted on block level (LUKS or dm-crypt) or filesystem level (ext4 crypto) crypto. This saves battery and improves performance. Once the drive is unlocked, the encryption is transparent to the OS. Simple to dual boot Linux or Windows on the same TCG Opal drive. Need to setup a Pre-Boot Authorization image to unlock the drive. This slows down the boot and can get clumsy with UEFI that expect consistent EFI boot options. Due to the transparent operation, it’s hard to lock the drive while the laptop is sleeping (S3) without operating system support. But, only maybe, see below. Your data is always visible to malware while booted. This is the same as most FDE solutions like LUKS and Bitlocker. Something like ext4 encryption would allow me to selectively encrypt data, I’ve used ecryptfs on my desktop for years for sensitive data at rest. My core goal is to protect the data on my laptop from access in the event the laptop is lost or stolen. Secondary goals are performance and battery life. TCG Opal checks all these boxes for me. My Dell Precision 5510 laptop came with an OEM Toshiba THNSN5256GPU7 NVMe 256GB drive from Dell. 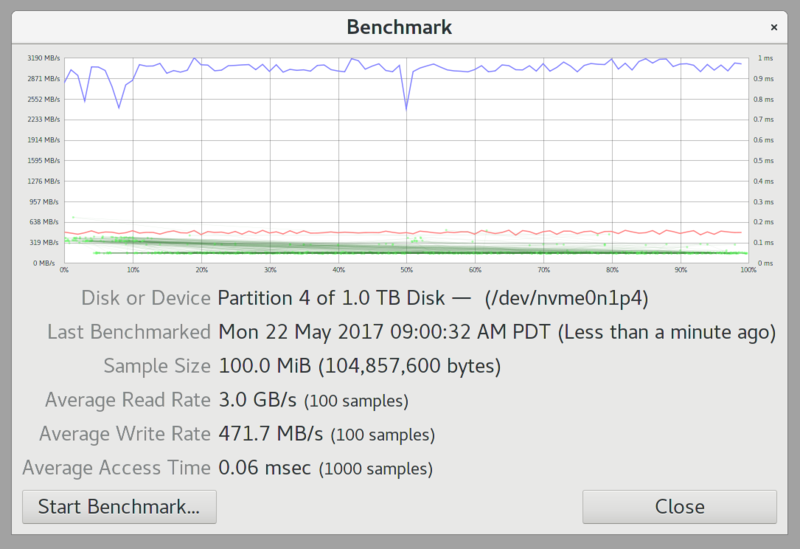 The NVMe drive is nice and fast, but didn’t have hardware crypto. Nor did it have enough space for standard laptop stuff and massive Yocto builds + Win10 dual boot install. I ran LUKS on the device to secure it in the event the laptop was stolen. However, I was always concerned that the max performance of the dm-crypt software would potentially slow down the drive and would certainly affect power efficiency. That said, there’s no way that LUKS could match the performance or power efficiency of the integrated TCG Opal support. I wrestled quite a bit with sedutil-cli and linuxpba to get it to recognize drive and work with it. Initially, sedutil-cli needed some patches to work with NVMe, which some people contributed but aren’t merged. After verifying the drive looked good for integration, I discovered that the Pre-Boot Authorization image needed similar patches to unlock the drive at boot time. Rebuilding the images was fraught with frustration as the Makefiles incorrectly build with the host toolchain and link against the host libraries instead of associated toolchains, this is evident by the symbol mismatches that are printed before the tools bail. I hacked together a fix for this and was able to get it to build and run on my laptop. The next struggle was understanding that on the Dell Precision 5510 (and likely the Dell XPS 9550 and new Dell XPS 9560 and Precision 5520) modifies the boot order and doesn’t respect the settings set by efibootmgr as the partition table changes when it’s locked and unlocked due to the way the shadow MBR works. The result was Syslinux failing at the boot: prompt after failing to load its config file when the MBR was locked. This was ultimately resolved by manually inserting to entries in to the Dell UEFI settings for Syslinux when the shadow MBR is present (drive locked) and when the drive is unlocked to use the systemd-boot boot loader I had been previously using. At this point I was able to boot to Linux and Win10 without issue. As these things go, there was (is?) a problem with the device sleeping as S3 support is necessary to unlock the drive upon resume from sleep. Without proper resume support, all the file systems disappear and everything melts down and then blows up. Of course it does. I learned that Linux 4.11 included support for OPAL SED devices and unlocking on resume from this patch set. I upgraded my laptop to a 4.11.1 kernel and began digging in to setting the key in the kernel with ioctl(IOC_OPAL_SAVE). Calling the ioctl() with my ASCII password of course didn’t work for many reasons. To start, IOC_OPAL_SAVE is only available on the NVMe name space devices (see sed_ioctl() in the kernel) and my utility reported Inappropriate ioctl for device. I disabled OPAL support following the sedutil wiki and re-ran the setup changing the device this time from /dev/nvme0 to /dev/nvme0n1 thinking that the kernel support and OPAL configuration needed to operate on the same name space, but am not sure if this even mattered. Now calling ioctl("/dev/nvme0n1, IOC_OPAL_SAVE, ...) didn’t return any errors, but failed to unlock after resume with error “Not Authorized”. After digging deeper I learned that that sedutil-cli was using pbkdf2 to hash my password (as it should). This requires deriving the hashed password the same way sedutil-cli does when it configures the device using pbkdf2 and friends. I ran sedutil-cli with gdb and extracted the derived hash and hacked it in to my test utility and ran it, this time it seemed to work, but I’m skeptical. Things don’t add-up, and when I least expect it something is going to blow-up in my face. What doesn’t work? Well, the laptop doesn’t seem to need the ioctl(IOC_OPAL_SAVE) called on every boot like the kernel code suggests. Now it spontaneously comes out of sleep just fine with no issues. HOW? This bothers me. Perhaps when I re-configured OPAL support on the /dev/nvme0n1 device (as opposed to the initial /dev/nvme0) device and updated my kernel to 4.11 (which added SED OPAL support) I enable a code path that fixes the sleep issue? I’m not sure, and when I don’t understand how things go from broken to fixed I expect them to return to broken with no warning. Win10 (booted from systemd-boot) seems to work just fine with resume as well, but I only tested it after everything seemed to work, I wish I tested it when Linux failed to resume from sleep. So, I’m concerned the thing isn’t actually locked. However, after every power on reset, the PBA appears (which is only present on the shadow MBR) asking me to unlock th device before rebooting and going to systemd-boot boot loader as expected. What gives? Does anyone know what’s going on? Does anyone else have Linux NVMe + TCG Opal + Sleep support working? I think I might have it working. I also might not. Stay tuned! If you’re trying out NVMe on UEFI system, checkout my sedutil repo with necessary fixes and definitely skip to the pre-built images if you can. Then you can help decipher the S3 sleep mystery. I’ve got problems, and I hope my readers have answers, drop me a line in the comments section below!